It was the top price residence sold in 2006 at €31m, and today it on the market with an asking price of just €5m. Gortanore, the 2,500 sq ft house on 3 acres of prime development land in upmarket Foxrock, south Dublin was bought by David Arnold’s D2 in 2006 and was the €31m was the top price paid for a residence in that year. Like that other white elephant, the €58m Sean Dunne-associated Walford on Shrewsbury Road, the purchase of Gortanore was followed by a fraught planning application, fiercely opposed by locals. Eventually permission was granted for the demolition of the house and the construction of a mixed use development with 37-apartment, shops, office space with 90 car-parking spaces. O’Mahony Pike, the architects for the scheme, had attracted criticism from Foxrock residents who said that the design was out of keeping with the Edwardian style that made up the original neighbourhood. The plans were met by 52 local objections. Despite this, Dún Laoghaire Rathdown County Council granted permission to demolish the house and outbuildings and build 37 apartments in three blocks with a gym and conference room, shops and commercial space at street level, and 90 car-parking spaces, 84 of which are at basement level. 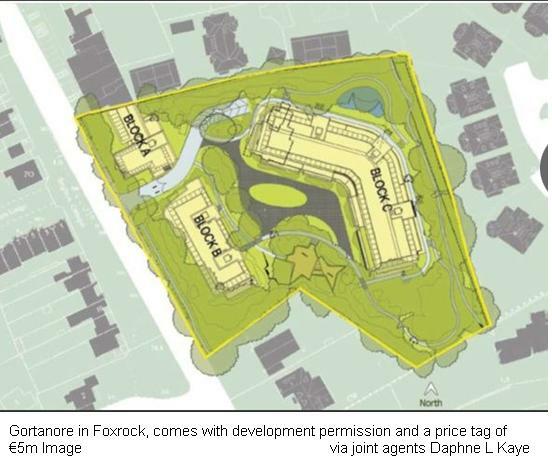 The apartments, on the edge of Foxrock village, are 1,800-3,000sq ft in size and are designed to have a full-time concierge. A development of apartments with similar aspirations was built close-by by Sean Dunne at Hollybrook, also on Brighton Road. Industry sources suggest the existing plans are unbuildable in the current climate, and that the permission will, in any event, presumably expire next year. Loans on some of David Arnold’s property did get acquired by NAMA, for example One Warrington Place in Dublin 2 which went on to be NAMA’s first staple finance sale. Loans on other properties stayed with the original lender, for example the Woolgate Exchange in London whose cGBP300m sale recently fell through and No 23 Saville Row in London’s West End, the sale of which for GBP 210m (€270m) was announced by UK commercial property portal CoStar.co.uk today. This morning, the Central Bank of Ireland (CBI) has released its monthly snapshot of the state of Irish banks focussing on deposits and lending. The data covers the period up to 31st July 2012 and shows that during the month of July 2012, deposits by ordinary households and businesses increased slightly at the so-called “covered” or State-supported banks – essentially the two pillar banks, Bank of Ireland and AIB, and also Permanent TSB. 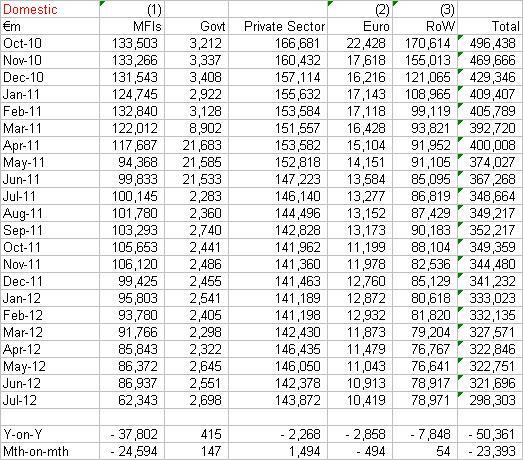 The increase of €0.4bn from €104.6bn in June 2012 to €105.0bn in July 2012 continues a trend of stabilising private sector deposits at the covered banks, and over the past year such deposits have increased by €2.4bn. Deposits are now back at May/June 2011 levels though are still €20bn lower than in October 2010 on the eve of the IMF/EU bailout. The CBI monthly commentary doesn’t appear to be available yet. The CBI doesn’t provide an analysis of private sector deposits at the covered banks – about the only analysis it doesn’t provide – but in terms of all banks operating in Ireland including foreign and IFSC banks, Irish household deposits fell by €119m in July, which brings such deposits to €92.0bn, the same as the July 2011 level. Total deposits from all sources in all Irish banks declined by €24.9bn in July with the main cause being a €25bn decline in deposits by Monetary Financial Institutions and the CBI has been asked for a comment. The Department of Finance last week published its “Deposits Trends” series for July 2012 which showed, according to the Department “deposits at the Covered Banks rose by €1.5bn (1.0%) month-on-month to €154.4bn. 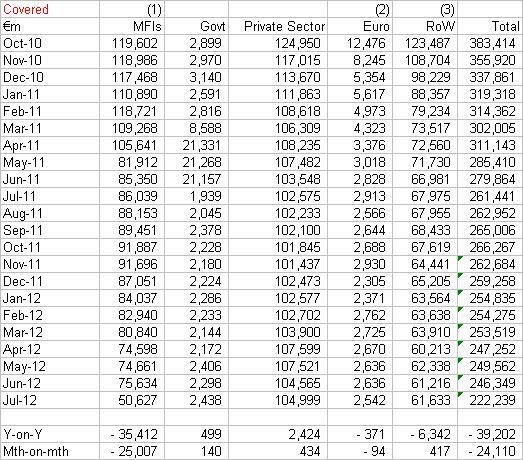 This represents an increase of €14.3bn to €154.4bn since reaching a low-point of c. €140bn in July 2011. This demonstrates depositor confidence in the strength of the banking system following its successful recapitalisation last year” These deposits include deposits at overseas branches, in particular at the Bank of Ireland/British Post Office, so they are of limited use, but trend indicates positive news. UPDATE: 31st August, 2012. The CBI commentary on today’s figures is here. There is no comment yet on the €25bn decline in MFI deposits. 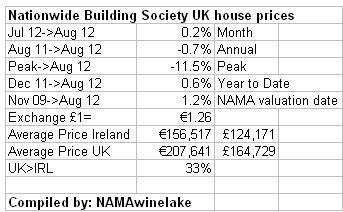 The Nationwide Building Society has this morning published its UK House Price data for August 2012. The Nationwide tends to be the first of the two UK building societies (the other being the Halifax) to produce house price data each month, it is one of the information sources referenced by NAMA’s Long Term Economic Value Regulation and is the source for the UK Residential key market data at the top of this page. The Nationwide says that the average price of a UK home is now GBP £164,729 (compared with GBP £164,389 in July 2012 and GBP £162,764 at the end of November 2009 – 30th November, 2009 is the Valuation date chosen by NAMA by reference to which it values the Current Market Values of assets underpinning NAMA loans). After three months of price declines, the Nationwide is describing this morning’s results as surprising given the continuing recession. The Nationwide provides comments on the seasonally adjusted figures, which show a 1.3% rebound in August. Prices in the UK are now 11.5% off the peak of GBP £186,044 in October 2007. 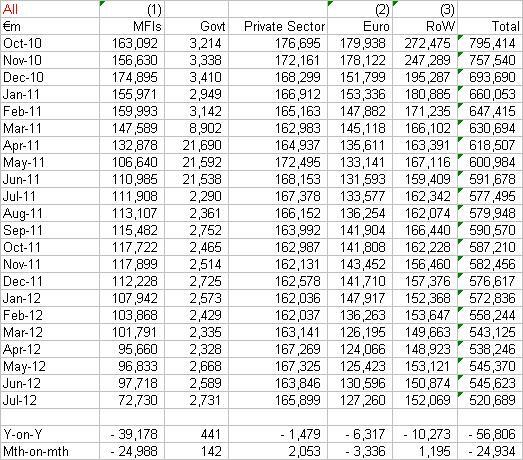 Interestingly the average house price at the end of August 2012 being GBP £164,729 (or €207,641 at GBP 1 = EUR 1.2605) is 33% above the €156,517 implied by applying the CSO July 2012 index to the PTSB/ESRI peak prices in Ireland. With the latest release from Nationwide, UK house prices have risen 1.2% since 30th November, 2009, the date chosen by NAMA pursuant to the section 73 of the NAMA Act by reference to which Current Market Values of assets are valued. The NWL Index is now at 803 (because only an estimated 20% of NAMA property in the UK is residential and only 29% of NAMA’s property overall is in the UK, small changes in UK residential have a negligible impact on the index) meaning that average prices of NAMA property must increase by a weighted average of 24.5% for NAMA to breakeven on a gross basis.